The Best Shark Dive in the World! : Eureka! barberi! The story, when I first heard it, was spectacular. The Coral Triangle is the epicenter of marine Biodiversity, a region that has been spared during the Glaciations and where many tropical species have found refuge, only to begin re-colonizing the Oceans once it got warmer again. In fact, if you progress to anywhere from its center, Biodiversity decreases. As you can see, it stretches from Indonesia all the way to the Solomon Islands. Biodiversity however decreases even within that region, with e.g. the Solomons featuring a lower number of species than, say, Irian Jaya. Apparently, the fable went, Fiji is an ancient portion of the Triangle that had broken off and subsequently, rafted across the Pacific to its present location. On its travels, Ark-like, it had carried along a sample of the Triangle's marine opulence, thus establishing a new independent and so far overlooked Biodiversity hotspot. That would have been remarkable insofar as the direction of the prevailing wind and currents, and thus, of larval (and thus marine species) dispersion in that region is East-to-West and thus opposed to Fiji's assumed tectonic progression. May the fabulator have been a prominent member of Fiji's diving community with a vested interest in promoting that destination? Well, there is a fragment of truth in it. Somewhat east of the Solomons-New Hebrides chain of today’s islands, an intra-Pacific plate subduction zone (Vitiaz trench) developed and gave rise to a string of volcanic islands on the west side of the trench, of which Solomons was at the west end and Fiji was at the SE end. The Ontong Java Plateau was on the Pp east of this island arc and it was moving west toward the subduction zone as was the portion of the Pp with the string of islands. The OJP pushed into the island arc and together they moved onto the continental basins formed by the sequential openings of the Coral Sea-Tasman, New Caledonian, and South Fiji basins. A right angles to the east of the island arch, a vertical [we’re talking Mercator projections] westward subduction zone was forming along the Pp margin which was creating the Tonga Islands. As the linear Solomon New Hebrides-Fiji arc pushed against the other forming-formed basins, the Fiji end got latched onto the north end of theTonga ridge. The north Fiji basin started opening between the New Hebrides and Fiji causing the NH to move west and Fiii to move east carrying a few pieces of the NH with it. Then the Lau basin began opening and split the Tonga ridge into the west Lau ridge, with islands forming, and the east Tonga ridge with its islands. When the original island arch was continuous, presumably the fishes (and other organisms) had continuous distributions. The separation of Fiji from New Heb on one side and from Tonga on the other allowed many taxa in Fiji to evolve into separate species. Thus enlightened (? ), I gather that what this means is that Plate Tectonics may have contributed to Fiji's Endemism but likely not boosted local Biodiversity. Nothing to sniff at by any stretch of the imagination - but certainly, nothing really unexpected, either. In fact, everybody in the know assures me that Fiji's marine Biodiversity is comparatively low and very much in line with what would have to be expected from its distance to the Triangle's epicenter. Provided that you believe in Darwinian Evolution, and I assume you do, you may remember that one of the principal preconditions for Speciation is Isolation. With Fiji haven broken away and gone walkabout, a new basin was opened and Gene Flow was interrupted as the genetic pool of Fiji stopped cross-breeding with the genetic pool of the Solomons in the West (and Tonga/Samoa, who in turn sit on their own tectonic micro-express, in the East). Whether owing to different selective pressures, Genetic Drift or the Founder Effect, the thus isolated population then had the chance to evolve into new, genetically distinct Species endemic to Fiji. As I said, nothing unexpected: the more remote an Island, the higher the chances for Endemism, marine and not, as witnessed in Hawaii, the Marquesas and even tiny Lord Howe. Thing is, Island Biogeography and especially, (terrestrial) Island Speciation never ceases to amaze me. Take for example Fiji's endemic Iguanas, probably descendants of a Green Iguana that had rafted over, Kon Tiki-like, all the way from the Americas (Australia has Goannas, not Iguanas) and then speciated into the three endemics. I just love the name of the latest discovery! Or take the incredible incubator Megapodes, some of which exploit the heat of active calderas. Once widely distributed throughout the Pacific, their local extinction correlates with the arrival of Homo sapiens and its bird-killing stowaways and introduced domesticates, alas an all-to-frequent pattern. Present in Vanuatu and Tonga - but not anymore in Fiji! Or, you can find such puzzling oddities as parthenogenetic giant Monitor Lizards having evolved, some say, in order to be able to prey on Dwarf Elephants on Komodo. Or Micro-Herps and another tribe of highly endemic Iguanas in the Caribbean. 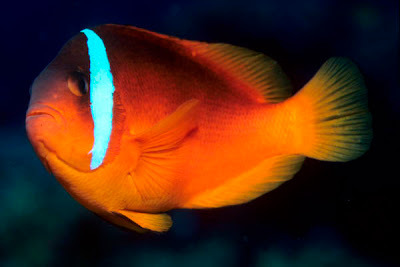 Back to Fiji's Fishes, there is indeed an increasing list of endemic species being discovered. Take for instance the famous USP Rabbitfish, or Bicolored Foxface that is common on Shark Reef. Or the spectacularly yellow, non-aggressive but nevertheless, venomous endemic Ovalau Fangblenny which is being mimicked by the yellow phase of the non-venomous but Fish-biting Bicolor Fangblenny. Or the three hitherto undescribed (and alas, hitherto uncollected and thus, undescribable) Fishes we found on Shark Reef last February. And then, there's the lil fella above, as far as I know the very latest (described) discovery. Amphiprion barberi, a new species of anemonefish fish, is described from 46 specimens, 16.3-85.8 mm SL, collected at depths of 2-10 m from coral reefs of Fiji, Tonga, and Samoa. It is closely allied to A. melanopus, which is widely distributed in the western Pacific. The two species exhibit significant colour-pattern differences, including a mainly reddish orange body in A. barberi and dark brown or blackish body in A. melanopus. Adults of the new species also possess fewer spinules (11-19 versus 19-26) in the upper-opercular series than A. melanopus. Genetic data presented here confirms the separation of these species. barberi, I discover, having a very pertinent connection to the above, Triangle, Tectonics, Biodiversity and all! This is Fiji's commonest Anemone Fish - and now, it is revealed that anybody who has ever seen them and not bothered to instantly engage in ecstatic outbreaks of Eureka! or the like, has been a total and utter ignoramus! At latest count, that would be everybody and his dog. And the dog of his dog! Wanna feel real stupid? Google A. barberi, A. melanopus, A. rubrocinctus and A. frenatus and compare the pix! Well, spinules or no spinules, Gerry is da man when it comes to Damnselfish (not a typo as anyone having taken pics at the Take Out will confirm), so who am I to raise my eyebrows and to bubble prick or picnic skunk the online fish nerds now bubbling happily among themselves about A New Clownfish!! !, as a friend knowingly admonished. The more as the Hawaii gang is due back in February! Having seen the error of our lumping ways, we shall forthwith swarm out and collect several dozen specimen of just about Anything! Maybe even the Darn Damsels, serves them right! Wanna bet that we'll manage to find some aberrant spinule or vomerine canine or some other equally indisputable and -spensable diagnostic feature?